Prominent & Leading Manufacturer from New Delhi, we offer hand lift table capacity 150kg, hydaulic lift table load capacity 300kg, scissor lift table load capacity 350kg, scissor lift table load capacity 150kg, hydraulic lift tables and hydraulic scissor lift table. 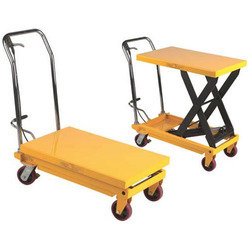 Manual lifting tables are used for convenience and flexibility. Hand lift tables are used to raise Light loads through relatively small distances. Common applications include pallet handling and positioning. 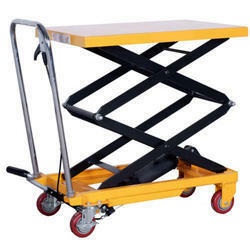 Manual Scissor lifting tables are used for convenience and flexibility. Hand Scissor lift tables are used to raise Light loads through relatively small distances. Common applications include pallet handling and positioning. Looking for Lifting Table ?